How Does a Depth Finder Work? In WWII, emerging sonar technology was instrumental in giving Allied navies the advantage over the Axis powers. Today, the same technology is used by recreational fishermen to gain the advantage over elusive fish. Sound waves are transmitted through water, and when they strike solid objects, they are bounced back toward the source. The strength of the sound wave upon its return, as well as the delay in time between when the sound wave was sent and when it was received, are analyzed to determine the location of other objects in the water. In WWII, destroyers sent these sonar signals to find lurking submarines. Today, fishermen send these signals in the hopes that they will bounce of off that night's dinner. A watercraft with a depth finder system has one or more transducers mounted to the hull. The transducer is the component that creates the sound wave and "listens" to the one that is bounced back. With the depth finder activated, these transducers can send and receive several distinct sound waves every second. When bounced-back sound waves are detected by a transducer, they are transmitted to a series of receivers in the watercraft. The receivers translate the sound waves into electrical signals that can be shown on a display screen in an easily readable form. 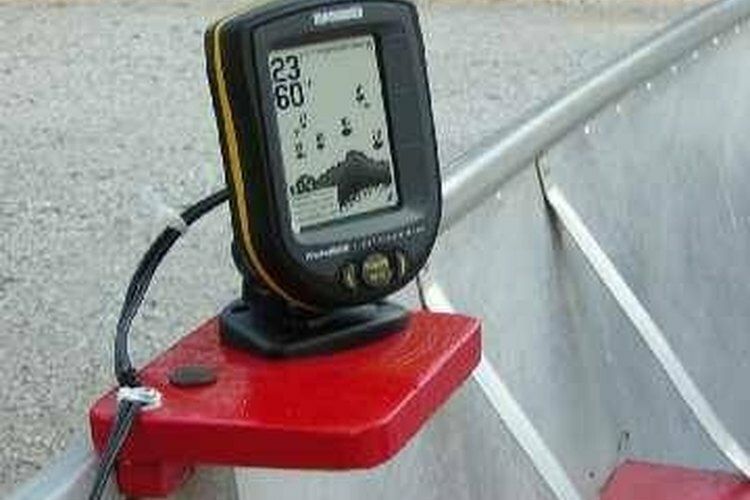 Every depth finder manufacturer has its own unique display interface. In the early days of commercial depth finders, the displays were very simple. They showed the landscape of the body of water beneath the watercraft, with everything represented in identical dots or squares. To find fish, users had to look for small groups of dots floating above larger masses of dots (presumably the floor of the body of water). Today, the depth finder technology is more accurate and the displays are more sophisticated. Modern transducers can actually distinguish between a fish, a strand of seaweed, an old tire and the lake floor. Fish are represented by little fish icons on the display, weeds are represented by little weeds and so on.